Bacterial speck, caused by the bacterium Pseudomonas syringae pv. tomato, is an economically important disease that decreases the marketability and yield of fresh-market and processing tomatoes. Over 20 years of research on tomato immunity and P. syringae virulence has resulted in deep understanding of the molecular players controlling disease resistance and susceptibility. Researchers in the Section of Plant Pathology and Plant-Microbe Biology and at the Boyce Thompson Institute in collaboration with scientists at the University of Florida and North Carolina State University have been funded by the NSF Plant Genome Research Program to explore natural genetic variation in the tomato immune system and use this information for crop improvement. The interaction between tomato and P. syringae has been an important model for understanding disease resistance. Greg Martin (Boyce Thompson Institute, SIPS Section of Plant Pathology and Plant-Microbe Biology) cloned the Pto resistance gene from tomato in 1993 while working in the program of Steve Tanksley. 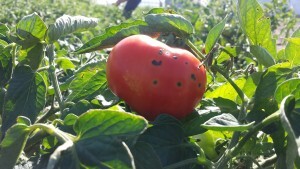 His research program has since uncovered many aspects of the tomato immune response, aided more recently by the complete genome sequence for tomato. The genome of P. syringae strain DC3000 was sequenced in 2001 and the research group of Alan Collmer (SIPS Section of Plant Pathology and Plant-Microbe Biology) has been a leader in identifying the many strategies this pathogen uses to avoid detection by the plant and cause disease. There is vast genetic variation in wild relatives of tomato, all of which can be crossed to cultivated tomato. With the genetic tools now available, researchers have the ability to rapidly uncover new sources of disease resistance. The goal of the NSF-funded project is to identify immunity-related genes in wild tomatoes by testing their responses to P. syringae strains carrying different combinations of virulence factors. Tomato genes found to play a role in immunity will be bred into fresh-market breeding lines, potentially leading to decreased use of pesticides, lowered costs for growers, and reduced impact on the environment. An additional aspect of the project is the improvement and promotion of the Vegevaders ™ game to entertain and teach high school students and the broader public about plant-pathogen interactions and evolution. Greg Martin is the principal investigator with co-PIs including Alan Collmer and Magdalen Lindeberg of the SIPS Section of Plant Pathology and Plant-Microbe Biology, and Zhangjun Fei and Susan Strickler of the Boyce Thompson Institute. Other co-PIs are Dilip Panthee at North Carolina State University and Sam Hutton at University of Florida. 2016 Liberty Hyde Bailey lecture: Greg Martin describes the significance of his research on disease resistance in tomato.